Honestly, it took some will power to step away from The Legend of Zelda: Skyward Sword long enough to write this. I'll share some in-depth thoughts about the game itself and its place in the series in the coming weeks, but today I want to take a different approach. As it stands now, it's not necessarily the game itself that keeps drawing me in, but the way I'm playing it. For the first time ever, I'm doing a collaborative playthrough of a Zelda game. My wife Hanah is making her first foray into the Zelda universe, while I am a grizzled veteran of the series. Together, we make an odd couple, but our partnership has been made the experience uniquely enjoyable. If you're being charitable, you could call Skyward Sword rooted in tradition. Some would argue that "repetition" is a better word. Either way, there is little denying that Zelda games have a specific formula. Playing with Hanah is refreshing because she hasn't grown accustomed to the formula yet. I know that we're almost done with the first three primary dungeons and we haven't yet filled out our inventory, which means there are likely four to seven more second-wave dungeons to go. I know exactly what happens when you catch a fairy in a bottle. I've done the ghostly toilet paper quest before. But to Hanah, this is all new and the novelty she experiences offers a vicarious excitement. It's also nice to have someone to diffuse my nerd rage and generally jaded outlook. Ultimately, it really doesn't matter that they Link isn't a lefty in Skyward Sword, and the fact that there are hidden treasure chests all around the world is actually pretty neat. Playing along with someone who is relatively new to the universe is an easy way to appreciate the things I usually take for granted. Thanks to my prior knowledge, we can quickly cut through the extraneous dialogue and didactic explanations of basic moves and get back to what makes a Zelda game special: encountering the unexpected. Thanks to Hanah's patience for questing and item collection, I've paid more attention to the crafting system than I would have on my own. As was the case in Twilight Princess, the world is crawling with insects to catch and utilize. Thanks to my wife's interest, they are more than simply moving scenery this time around. Of course, not everything in Skyward Sword is a re-hash. Thanks to its extensive use of motion controls, it's a new experience for even long-time Zelda players. Testing the capabilities of the Wii Motion Plus by experimenting with the new swordplay techniques, item capabilities, and even Link's basic movement is an adventure unto itself. Since the motion invalidates a good chunk of my prior skills, we're both analyzing the best tactics to employ. We've already had some in-depth discussions about the game's design choices that, in retrospect, were worthy of a podcast. 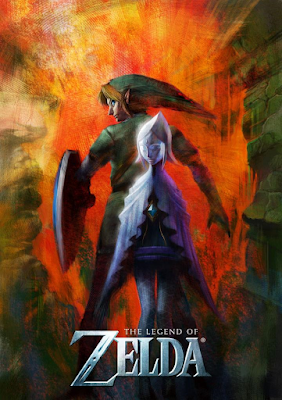 While Skyward Sword hasn't always been the most intuitive or technically polished adventure (for example: a malfunctioning nunchuk hampered the first few hours of our journey), it has been a memorable one. Skyward Sword is a dramatic departure for the series in a variety of ways, and it's been nice to have a companion in this brave new world that has such waggle in it. Oh man. That's one black hole looming on the horizon. I'm curious: how do you two play it collaboratively? I find your tale of collaboration in playing Skyward Sword to be really cute. However, whenever I hear stories of two people playing through a single player game (together) I always wonder if it makes it more difficult to actually develop the muscle memory and game skills to do the harder parts of the game? I feel like that would be the case sometimes since each player is only (supposedly) getting half of the "play time" while the developer usually thinks of only one person playing through all of the adventure. As for our method, we're kind of doing simultaneous playthrough. We each have a save file, but sometimes we'll jump into each other's games to collect some stuff or defeat a particularly challenging enemy. It's not the most efficient way of doing it, but sometimes our schedules mean we sometimes have to play the game at different paces. You have a point, and the main reason why this works is two-fold. First, Skyward Sword is a relatively long game, so we both have many hours to get comfortable with the mechanics and dynamics. Second, the fact remains that I have way more history with Zelda, and Hanah has far less patience with protracted combat. Hanah will often just pass the controller off during a fight or eschew Fi's advice on puzzles in favor of mine. Similarly, I'm just as happy letting her collect bugs and craft, since I'd probably ignore much of that portion on my own in the interest of time. It's not the perfect solution for mastering a game, but I'm interested to see how the experiment will pan out! When I started reading about you doing a collaborative playthrough of a single player game it reminded me of when I was younger and the first time I played through Half Life at my friends house (my pc couldn't handle it). instead of the usual hot seat style of play where once you die, your friend takes over we decided to split the controls. One took the keyboard, the other took the mouse. It lead to many, many needless/hilarious deaths and still remains one of my favourite playthroughs of a game. often we would have to plan out out actions before entering a room of enemies, stating exactly where we were planning to run and what the main threats were that needed dealing with first. so much fun! I would love to try this again. thanks for reminding me of this gaming memory. That's hilarious! It must have been like driving a car with one person on the pedals and one on the steering wheel...except with more head crabs.